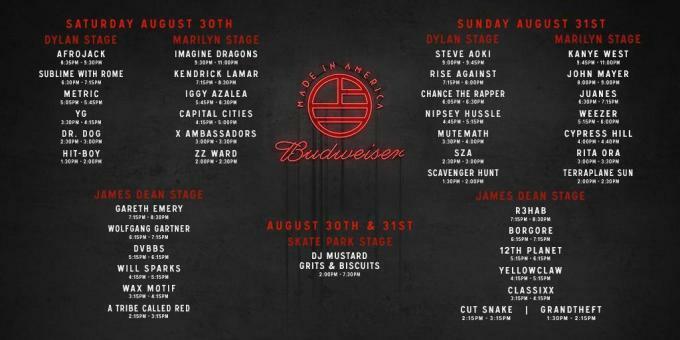 Budweiser and Jay Z&apos;s highly-anticipated 2014 "Made In America" festival is finally here, and for the first time in the event&apos;s history, it will be going down in two cities. 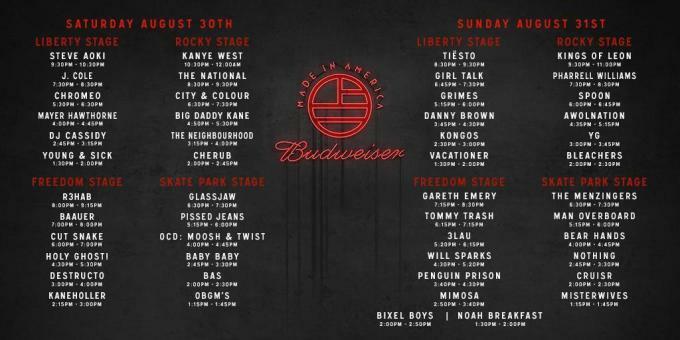 Luckily enough, if you weren&apos;t able to make it out to either Philadelphia or Los Angeles this weekend, Budweiser and Hov are streaming the event so you can watch it right from your couch. Like previous years, the lineup for the event is stacked, with Kanye West, Kendrick Lamar, YG, J. Cole, Imagine Dragons, SZA, Pharrell and many more hitting the stage. Tonight, Kanye will perform for a second time at the festival, this time in Los Angeles. Full set times for the weekend&apos;s performances can be seen below, and you can view the stream of both events live on Budweiser&apos;s website here or above. If you missed it, check out Kanye West&apos;s entire performance from the Philly show last night.